Riniker-Radich, who was born in Switzerland, spent her childhood in Panama before studying art in Geneva and delivering an ambitious body of work in drawing and sculpture. Expanding her scrutiny of architectural aesthetics and its institutionalized standards in her current exhibition, the artist subverts safety and isolation perpetuated by being behind the enclosing borders of home. 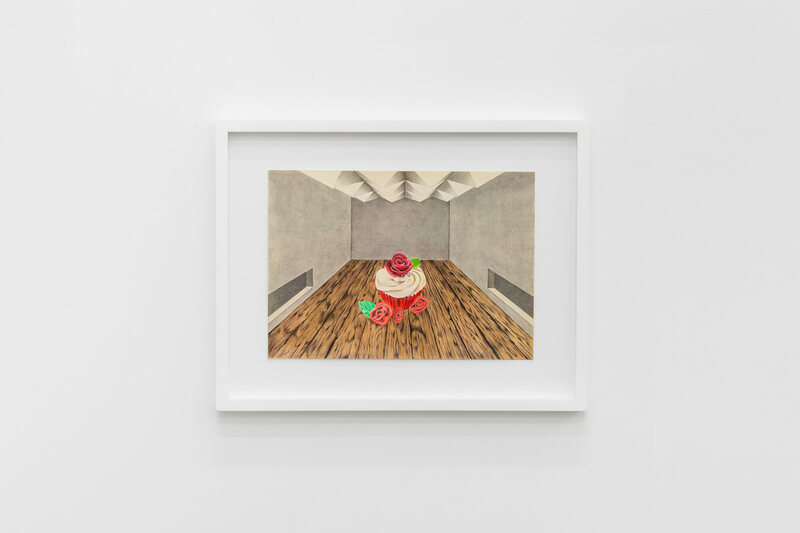 The tension between risk-taking and seeking comfort plays out in particular here, from the filters the artist has employed to cover gallery windows, to her lush drawings of gluttonous desserts offering sweet escape from the turbulence she implies elsewhere. The most emblematic juxtaposition of momentary escapism and voluntary isolation, however, is The Private Sphere, a series of resin cast earplugs in bright pinks and reds scattered around the Swiss Institute’s interior, which echoes a domestic structure. Spread haphazardly around the show, these earplugs, used in loud cities such as New York, promise contemplation and alienation through their superfluous and moldable connotations. Riniker-Radich’s subject matter in the states turns her attention towards these spaces of tightly compressed levels of existence, and the materials, like these earplugs, that mediate living in various perceptual spheres within close proximity. The show also features a series of whips made out of mundane objects such as plastic hoses or metal wires. Aptly titled The thoughts mold the brain, as certainly as the brain molds the thoughts, these relics, and their sadomasochistic implications, are protected inside glass and wooden vitrines as cherished relics, in contrast to their everyday materials. Stemming from utilitarian domestic tools like a typical gardening hose, these objects complicate social complicity or concepts of domestic idleness and mediocracy explored elsewhere, bringing the philosophical underpinnings of separatist politics, and the bodily price it implies, into view.